The Pittsburgh Penguins are trying to strengthen their roster ahead of the NHL trade deadline while the Florida Panthers are either doing the same or attempting to clear up some salary-cap space for bigger moves. 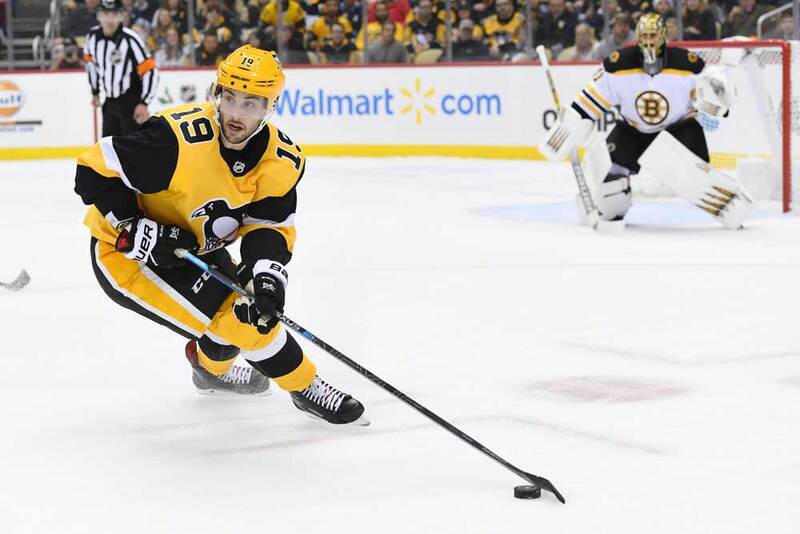 The teams pulled off a four-player/three draft pick trade on Feb. 1st as the Penguins sent center Derick Brassard and winger Riley Sheahan to Florida for centers Nick Bjugstad and Jared McCann. The Penguins also gave up a second-round draft pick along with two fourth-rounders this summer. The Penguins are in the midst of a tight playoff race in the Metropolitan Division and Eastern Conference while the Panthers’ chances of making the postseason are slimmer as they’re 12 points back of the second Eastern wildcard playoff spot. It was the second deal of the week for Pittsburgh general manager Jim Rutherford as he traded 26-year-old defenseman Jamie Oleksiak to the Dallas Stars a few days earlier for a fourth-round pick. That deal and shipping out Brassard and Sheahan enabled him to clear enough cap space for Bjugstad and McCann. The 26-year-old Bjugstad had chipped in with five goals and seven assists in 32 contests this season. His salary-cap hit is $4.1 million and he’s signed until the end of the 2020/21 campaign. He enjoyed a career year last season with 19 goals and 30 assists with the Panthers. The 22-year-old McCann has notched eight goals and 10 assists this year in 46 outings. His salary-cap hit is $1.25 million a season and he’s under contract until June of 2020 when he’ll become a restricted free agent. The 27-year-old Sheahan was also acquired by Pittsburgh last season in a deal with the Detroit Red Wings. He had registered seven goals and a pair of assists with the Penguins this year. He’s making $2.1 million in 2018/19 and is also set to become an unrestricted free agent this summer. If you read between the lines in this trade you’ll see the Panthers can save $5.1 million in salary-cap space starting next season if they don’t offer new contracts to Brassard and Sheahan. They can simply let them walk as free agents or even trade them again before this year’s deadline. Florida general manager Dale Tallon has already picked up three draft picks in this deal and could stockpile more assets if there are any takers for either or both of his new players. It’s believed Tallon plans to exercise one of those options and then intends to take a run at pending free agent goaltender Sergei Bobrovsky and forward Artemi Panarin. Both Bobrovsky and Panarin are under contract with the Columbus Blue Jackets at the moment and it’s believed neither of the Russian natives intend to ink new deals in Columbus. They could very well be traded before this year’s deadline, but this doesn’t change their free-agency situation. It’s also believed Tallon will free up more salary-cap space by buying out the contract of goaltender James Reimer. With Florida’s attendance being one of the lowest in the NHL, the club is hoping a couple of stars like the 30-year-old Bobrovsky and 27-year-old Panarin will help attract fans on a regular basis. Panarin has stated that he has no problem playing in Columbus for head coach John Tortorella, but he simply wants to move to and play in a bigger city. Fort Lauderdale may not fit that bill, but it has been rumored in the past that Panarin would consider moving there. With Brassard and Sheahan gone, both Bjugstad and McCann will be expected add more scoring depth to the Penguins’ bottom six forwards with Sidney Crosby and Evgeni Malkin having locks on the top two center jobs. If needed, the newcomers could also play on the wing in the Steel City. The Penguins are in a dogfight to make the playoffs this season and Rutherford will certainly be keeping an eye on the team’s progress between now and the trade deadline. If it doesn’t look like the side has improved in the next few weeks he won’t be afraid to make another move or two. With Pittsburgh winning the Stanley Cup three times in the past 10 years (2009, 2016 and 2017) fans and management won’t settle for anything less than a playoff berth this spring.